The Advocacy Center is a unit of the Global Markets/Commercial Service (GM/CS) bureau of the International Trade Administration, U.S. Department of Commerce. Based in Washington, D.C., the Advocacy Center coordinates U.S. government interagency advocacy efforts on behalf of U.S. exporters bidding on public-sector contracts with overseas governments and government agencies. We work very closely with the GM/CS network of domestic Export Assistance Centers and Commercial Offices within U.S. diplomatic missions overseas. The Advocacy Center helps to ensure that sales of U.S. products and services have the best possible chance competing abroad. Advocacy assistance is wide and varied but often involves companies that want the U.S. Government to communicate a message to foreign governments or government-owned corporations on behalf of their commercial interest, typically in a competitive bid contest. Since its creation in 1993, the Advocacy Center has helped hundreds of U.S. companies — small, medium and large enterprises in various industry sectors — to win government contracts across the globe. In short, we are your advocates! In pursuing foreign business opportunities, we encourage you and your company to contact us early and often. 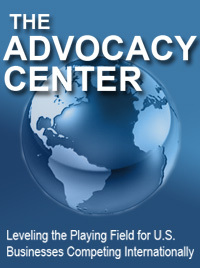 The Advocacy Center also has GM/CS liaisons to five Multilateral Development Banks (World Bank, Inter-American Development Bank, African Development Bank, European Bank for Reconstruction and Development, and Asian Development Bank) to assist U.S. firms and advocate on their behalf when they compete for Bank tenders. The liaisons counsel U.S. companies on how to work with the Banks and advocate on procurement and contracting issues to ensure fair and equal treatment for U.S. companies.